If the mere mention of grammar hasn’t sent you fleeing for the hills, well done! This blog post will cover a three select grammar rules that can be difficult to nail down. I am sure you’ve heard of this comma usage rule, but how do you identify an introductory clause in order to put a comma after it? Introductory clauses are dependent clauses (a clause that does not make sense on its own). They set the stage for the main event, the independent clause(s) of your sentences. Introductory clauses start with adverbs like “although”, “if”, and “when”. Understanding that introductory clauses do not make sense independently from the main body of the sentence can help you identify them. Think of them as build up to the main point of your overall sentence. The word “its” is a possessive pronoun and thus does not need an apostrophe to illustrate a possessive. It’s really busy in Prospector today. This is a common but easily fixable mistake. Just think to yourself as you write, are you trying to convey the words “it is” or a possessive? Let’s hope back on the ol’ independent clause train again! When I got to the gym. I went on the treadmill. “When I got to the gym” is not an independent clause, and is therefore not a full sentence. The first part of the sentence modifies and explains where the treadmill activity happened, so a comma is what is needed here. During the First World War and just after the Battle of the Somme. This sentence is missing some serious “so what” factor! This is a common mistake because as a writer you know exactly what you mean, but a reader is left wondering exactly what happened. Be sure to read your writing objectively. Try to distance yourself enough from your topic and ask yourself if what you are writing would make sense to a novice. When trying to avoid sentence fragments, keeping in mind the question “so what?” is infinitely helpful in combatting the issue. When you proofread, ask that question to yourself again and again. Congrats! You made it to the end of a grammar blog post! We have covered three tricky but easy to fix grammar issues. By now, you should be feeling more confident in tackling these in your own writing. Remember that tutors at the Writing Resources Center is always here if you more clarification on any of these issues! This blog post will guide you down the yellow brick to understand coordinating conjunctions. Firstly, let’s establish exactly what a coordinating conjunction is. Coordinating conjunctions connect words, phrases, and clauses that are of the same syntactic importance together each in their own unique way. This becomes especially important in academic writing because you will be creating more complex sentences as your ideas become more complex. I take good care of my teeth, for it is expensive to go to the dentist. I brush and floss my teeth twice a day. I have never had a root canal nor braces. My dog has really bad breath, but he hates having his teeth cleaned. After I go to the dentist, my reward will be either a new toothbrush or a sundae! I am terrified of the dentist, yet I go twice a year. Dentists make a lot of money, so I have decided that’s what I’ll be! That was a lot to sink your teeth into! As you can see each of these words perform the same function of linking two words, clauses, or phrases together. Which word you chose to perform this function can impact whether you are comparing, contrasting, explaining, or adding to. For example, and is clearly adding to the already established information; whereas, the word but is contrasting with something that has already been mentioned. I have not been paid this month, but I may have to visit the dentist because my toothache is becoming worse. In the above example, each clause on either side of the “but” is independent – they make sense by themselves. I am connecting my lack of money with the fact that I need to spend money on a trip to the dentist with the coordinating conjunction “but,” highlighting the connection between these two pieces of information. My dentist has a hairy nose and bad breath. “My dentist has a hairy nose” is an independent clause but “bad breath” is not. So, the comma rule does not apply here and the sentence is grammatically correct without one. Choosing the appropriate coordinating conjunction for your sentence can greatly impact the overall meaning, so while these monosyllabic words can seem negligible they have a lot of influence over meaning. Introductions can be the hardest part of the paper to write. Oftentimes you know what you want to write, but you aren’t sure how to start. I’m here today to help you with that start by showing you how to write a strong introduction in five easy steps! Step One: Draw your reader in. You want your reader to be interested in your writing; therefore, you must reel them in! You might be asking yourself “How do I do that?” Don’t worry, I will tell you with some dos and don’ts. Do start with something catchy. If you are writing about WW1, start with something unique (that is relevant to your topic!). It is boring to read “World War one began in 1914.” Instead try this “In 1914 the face of global warfare would change forever.” Do you see how this is more interesting? Don’t start with a quote. You want to start with your own words rather than someone else’s. When you start your paper with a quote, it makes you appear to be unsure of what you are saying. It can also make you sound like you are writing at a high school level. Take care to avoid this pitfall. This is your paper, your reader wants to hear your words not President Woodrow Wilson’s. What is your paper about? This is not your thesis, but will tell your reader about the big picture behind what you are going to write about. Continuing with our WW1 example, I would go on to say “World War one was an unprecedented event that changed not only the landscape of warfare, but also introduced the concept of an ambiguous enemy.” Your reader knows that you are going to talk about how WW1 changed warfare, but they don’t know exactly what you are going to talk about yet. You are going from a broad idea to your narrower thesis. Your thesis is the most important part of your introduction. This tells your reader exactly what the point of your entire paper is. Therefore, it should be easy to spot and understand. Here is my thesis for the WW1 example: “During WW1, warfare was changed due to the increase in advanced technology.” This is the point I am going to argue in the body my paper. Typically your thesis should be the second to last sentence in your introduction. This means you are almost done! Finally you are ready to transition into the body portion of your paper. You can now expand on those ideas you have had since you set out to write your paper. First, though, you need to use a transition sentence to move from your introduction to your first body paragraph. Think about what you want to expand on first in your paper, then introduce it briefly in your introduction. For example: One piece of advanced technology was the use of trench warfare instead of face to face combat. There! Now you are ready to begin your paper. You don’t have to start drafting your paper with the introduction. If you know what you want to write in the body, but are stuck on the introduction, then begin writing what you already know. You can always come back to the introduction when you have a better idea of how you want to begin. In the writing center we often suggest this to writers who have trouble starting out or are stuck on their introduction paragraph. There isn’t a law that you absolutely have to start with the introduction, so write what you can and go back to it when you are ready. You can also start with your thesis. If you know your argument then start with that and write around it. This will help guide not only your introduction, but with the larger paper as well. Now go forth and write great introductions! The most common way to signify possession in English is by using an apostrophe. Is that Mr. Johnson’s car? Though this is easy enough to understand, there are some common mistakes when using possessive apostrophes. This confusion is understandable because people have different preferences about how to do this. The truth is that there are two acceptable ways to punctuate singular possessive nouns. Correct: What do you think of Chris’ report? Correct: What do you think of Chris’s report? Both of these are acceptable, and they are spoken identically– something like, “Chris-iz”. On the other hand, plural nouns never get an additional “s” at the end, otherwise they would be incorrect or appear to revert back to the singular. Recognize when you are distinguishing a singular subject and a plural subject. The following two examples are correct in representing the possession of a single store or attorney, but incorrect for showing possession for multiple stores or attorneys. There are also a number of irregular plural nouns that are treated grammatically as singular subjects such as: media’s coverage or people’s beliefs. Another thing that gets people into trouble is when they confuse a noun that needs a possessive apostrophe for the plural form of the noun. Incorrect: What is the companies policy regarding sick days? Correct: What is the company’s policy regarding sick days? The first sentence implies no possession at all. If I wanted to refer to the policy of multiple companies, I could write, “What is the companies’ policy…,” but the first sentence doesn’t make sense grammatically as is. You also want to be careful not to put the apostrophe in the wrong place. If someone’s last name ends with an “s,” you don’t want to put an apostrophe within their name. If you are referring to two or more subjects but the thing they are possessing is the same, you only add an apostrophe to the latter subject. For instance, “Kim and Roger’s house is very roomy.” If, however, you are referring to two people with two separate houses, “Andrew’s and Ralph’s houses are very roomy” is acceptable. If you are using a compound noun, like mother-in-law or editor-in-chief, the apostrophe is used on the last word. So, mother-in-law’s and editor-in-chief’s. There are, of course, other ways to indicate possession besides the apostrophe. The way to indicate possession in many other languages besides English (but also English) is to have the thing being possessed precede the possessor. Though, as discussed in the nominalization post, this inverts the typical and preferred syntactic structure, it is grammatically correct. That is the company’s policy. That is the policy of the company. This construction should be used sparingly, not just because of the syntactic inversion, but because it can sound very unnatural. Most of the time, the apostrophe is the best way to indicate possession. It is not incorrect, but the sentence, “That is the coat of Mika” sounds strange to a native ear. Finally, the other way to indicate possession is by using possessive adjective like, my, your, his, her, its, their, our and possessive pronouns like, mine, yours, his, hers, its, theirs, and ours. Possessive adjectives are used just like other adjectives in that they modify the noun to give more information. Just as the adjective “nice” modifies the noun in the following sentence, we can exchange it for the word “my” to indicate possession. That is a nice watch. Possessive pronouns, just like regular pronouns, take the place of the noun. And often it is taking the place of a noun modified by a possessive pronoun. In response to the question, “Is that your watch?” You could respond with, “Yes, it’s my watch. If you don’t want to sound like a robot, however, it sounds more natural to say, “Yes, it’s mine,” where the pronoun mine replaces the established referent, my watch. Hey everyone! If you’ve ever taken a class that focuses on writing, you may have heard the terms “literacy narrative,” “literacy biography,” or something along those lines before. Today’s post is going to delve into traditional literacy narratives, what they’re all about, what their purpose is, and how they are really amazing tools for finding out about how you write! There will also be some helpful tips for writing literacy narratives, too! First thing’s first—what exactly is a literacy narrative? So basically, if you put these three definitions together, you get a really vague sense of what a literacy narrative is. A literacy narrative is a story about your own experience with writing and reading, as well as your knowledge on a particular subject of your choosing, whether it be music, learning a new language, the story of how you learned to read—anything! In assigning literacy narratives, professors are asking students to take what they’ve learned about literacy development and apply that to their life stories. Depending on the class and the professor, students may be asked to explore stories that include substantial experiences and powerful sponsors, (people,) who motivated them, and to reflect on them. 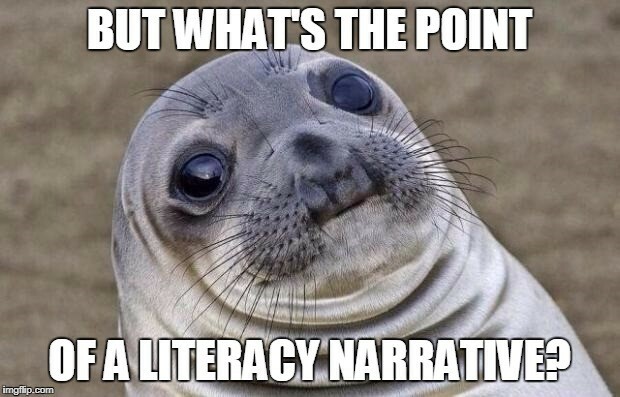 Now that we have a somewhat solid idea of what exactly a literacy narrative is, you’re probably wondering about the purpose of it all. Many professors use literacy narratives in their classes because it’s a great assignment for self-examination. In fact, most University Writing courses (UWRT) have some form of a literacy narrative/biography assignment because it helps students learn to reflect on their experiences with writing and reading. Of course, there are many reasons why literacy narratives are popular assignments in first year writing (and other!) classrooms. Here are three examples of how literacy narratives are amazing tools (inspired by the awesome article, “10 Ways Literacy Narratives Will Rock Your World (or at least your writing classroom)”). Reflection & Overcoming Resistance: In this article, the author chooses to use words like “exorcism” and “scar tissue;” however, those words seem a little too simple to encompass what literacy narratives can actually do. Literacy narratives offer students a chance to examine past experiences—be they pleasant memories, uncomfortable baggage, voices, scars, etc.—and allow them to write through those experiences. While reflecting on these experiences, some students can then go further and use their writing as a way of overcoming the resistance found in those moments, and in turn, they have a successful product that shows their resilience. Now, I’m not saying that literacy narratives turn classrooms into a “Dead Poets Society” sort of scenario (cue the scene from the movie, “Oh captain, my captain!”) However, assignments like literacy narratives really do give students opportunities to deal with sometimes tough, uncomfortable issues, and that is a great learning experience. Connection: When working on literacy narratives, sometimes professors have students work in groups to brainstorm or revise their ideas/papers. This can seem a little awkward at first, (that’s natural!) but working with others and opening yourselves up via literacy narratives can really help students learn to connect with one another. In fact, these experiences working with group members can help students collaborate with others in the future. Scaffolding: Not only can literacy narratives be extremely cathartic, but they can also be fun. Yeah, yeah, I know it’s almost blasphemy to say that an assignment can be fun, but it’s true! Compared to other assignments that students have in other classes, a literacy narrative may not be seen as challenging. In fact, many students often take pleasure in literacy narratives because it gives them time to focus on themselves, (instead of the rest of their never ending homework) to reflect, and to write. 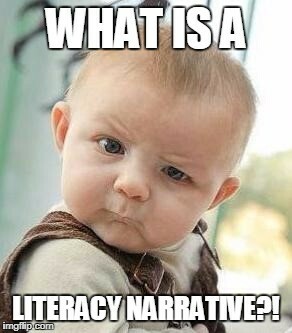 Now that you know what literacy narratives generally are and why they are awesome, you’re probably beginning to wonder about how to go about writing one yourself! First thing is first: follow the prompt! Everyone has their own different ideas of what a literacy narrative is, so what your professors asks you to write about will ultimately affect where you start and what you write about. Make sure you understand exactly what it is your professor wants you to explore in your literacy narrative and you will be good to go. Sarah from Letterpile suggests that you ask yourself some thought-provoking questions to get yourself started. She writes, ““Generate a few topics that are meaningful to you. Ask yourself, what do I want to write about for my literacy narrative? Do I want to write about my favorite book? Do I want to write about writing poetry? Do I want to write about overcoming a big hurdle? List those topic ideas” (Letterpile). Once you choose a topic, then you can start to consider other things, like your audience and the story you want to tell! The Pen & The Pad also suggests using “vivid details” to help your narrative really sparkle! They also emphasize the importance of reflection, and recommend that you take some time to reflect “on how the event you’re writing about changed or shaped you” (The Pen & The Pad). 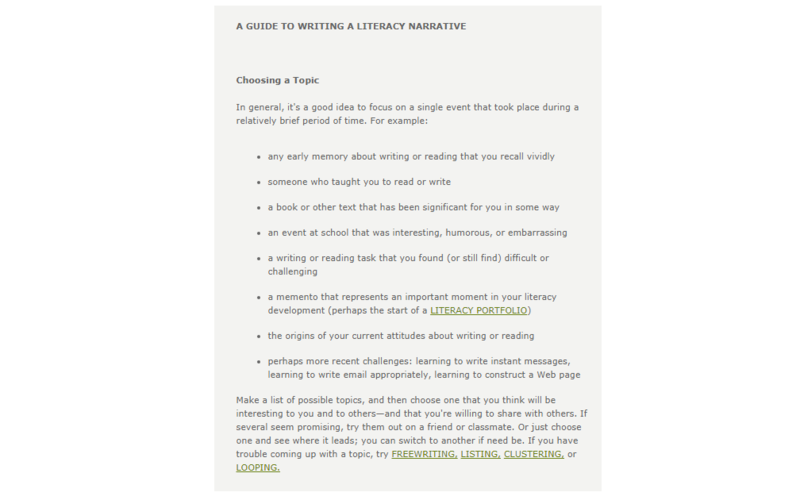 These are only a few suggestions to help you begin your literacy narrative. However, there’s no one right way to go about it—what is important is that you take some time to think, write, and reflect on your story. As simple as that seems, it can really open your eyes to how you have evolved as a writer and reader! Nominalizations- know them; try not to use them. Nominalizations. What are they? A nominalization is when a word, typically a verb or adjective, is made into a noun. Why do we need them? Because it is often useful to identify what a thing is rather than what it is doing or what it is describing. You will write with more fluency if you are aware of both the root forms of nominalized words and how to nominalize familiar and unfamiliar words. Since it’s English, there are plenty of exceptions, but there are many common suffixes that will help you to recognize nominalizations. Suffixes like: -tion (operation), -sion (comprehension) -ty (flexibility), -ness (happiness), -ment (commitment), -ance (governance), and -ence (conference), -ism (capitalism), -ury (usury). And from nominalize–> we get nominalization. And from hopeless–>we get hopelessness. Note that the suffix -al may not always constitute a nominalization. It can also be used to convert a noun into an adjective, as in autumnal. Note that just like the -al suffix, the suffix alone will not be sufficient to determine whether it is the verb form of the noun or vice versa, so always consult a dictionary if you’re unsure. Perjure, for example, has a -ure suffix, but it is the verb form; perjury is the noun form. When we write in academic spaces, we are often tempted to effect an elevated or formal diction, and nominalizations are one way to do this. However, it is not advisable in most cases. Using nominalizations makes the writing passive rather than active, and tends to disrupt typical sentence structure (subject–verb–object), which is most comprehensible to us. Of the following two sentences, the latter is clearer because the subject is foremost in the sentence and active. Original: The experience of children with respect to being at school for the first time is common. Revised: Many children experience worries when they go to school for the first time. While we are interested in “the experience of children,” making experience rather than children the subject makes the sentence needlessly abstract. The former sentence makes experience the predicate rather than the subject. Note: the example using “experience” is known as a zero-change nominalization, where the form of the word is the same for both the noun and the verb. Another example is “murder” which can refer both the act (to murder) or the thing itself (a murder). Original: The companies reached an agreement to build in the neighborhood. Revised: The companies agreed to build in the neighborhood. Losing the nominalization makes the revised sentence less wordy. The subject-predicate position is not affected in this case, but why use a verb phrase with a nominalization when a verb will do. Do we know more by understanding that the reached an agreement rather than simply agreed? Not really. This aversion to nominalizations is a somewhat recent backlash in academic culture, so more conservative fields, like science and law have been slow to adopt this change, but if we are thinking about how to write with clarity, this is practically axiomatic. However, feel free to defer to the stylistic preferences of your professors. Of course not. Just don’t use them without reason. You will need to refer to things and concepts as things and concepts. But if your are nominalizing what should be your verb or adjective for the sake of reaching a word count, or sounding like a smarty-pants, know that your professor can probably tell. The grammar of the written language differs greatly from that of spoken language. This difference is attributable to the constant innovations of spoken language (Kolln, Gray 126). If you are further interested in other kinds of nominalizations like agent and recipient nouns, and gerunds, consult this site. Kolln, Martha, and Loretta S. Gray. Rhetorical Grammar: Grammatical Choices, Rhetorical Effects. , 2017. Print. 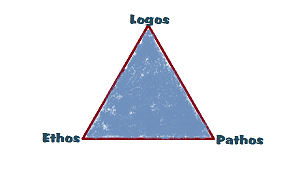 The Rhetorical Triangle is composed of three parts: Ethos, Pathos, and Logos. It is often represented by an equilateral triangle: all three sides are equidistant from one another to show the equal importance of each concept to effective communication and persuasion. Aristotle (the Greek philosopher and rhetorician) taught that audience appeal in these three areas is what determines whether a speaker can effectively persuade, but this does, in fact, extend to all forms of communication, including writing! Ethos is what convinces your reader that you’re a writer of character and credibility. It employs a variety of techniques to show the reader that you as the writer know what you’re talking about and are trustworthy enough to provide the right information to the reader. As a writer, you’re tasked with persuading your reader to accept your thesis/argument as true. In order to do this, you should show that you’ve considered multiple viewpoints in the development of your argument by correctly citing and documenting sources, and illustrate an awareness of the genre and purpose by choosing appropriate words and a suitable tone. This is where professionalism and formality come in: if you send an email to, say, a professor, and you begin the email with “What’s up,” you immediately destroy your ethos; your reader will assume that you are unaware of generic conventions, and whether you like it or not, may believe that you aren’t invested in the course or the subject. Think of Ethos as your chance to make a good impression. You want to put the right foot forward from the beginning and show your reader that you’ve done the work, you know your subject, and that they can trust you to tell the truth. If your reader inherently trusts you, then it will be much easier for them to believe you! On the opposite end of the spectrum, Pathos is an appeal to emotion, beliefs, and values. Instead of focusing on the writer’s role, it places emphasis on the role of the audience/reader. In some genres, this is a direct appeal to the audience’s emotions through, say, the telling of a heart-wrenching story with vivid detail and imagery; other times, it caters to belief and value systems that the writer knows his or her readers might ascribe to through specific, relatable examples. Essentially, Pathos is how you make your subject matter to your reader. Regardless of the method by which you appeal to audience, Pathos requires that you think about your audience even before you begin writing, asking yourself who you want to read your work and who is likely to read it. If you have an idea of who your audience is, it will be much easier for you to appeal to them using Pathos. Some of the best examples of Pathos that we see on a regular basis are advertisements. Think of the last commercial that stood out to you. Why do you remember it? The Cam Newton Buick commercial from the 2017 Super Bowl employs Pathos incredibly well; small children play football in a field when parent points out a new Buick to another parent, who says “If that’s a Buick, then my kid’s Cam Newton.” The kid promptly morphs into the popular Panthers quarterback, much to the chagrin of the parents and young football players. It seems like a silly way to sell a car, but the thing is, it’s one of the only ads I remember from the 2017 Super Bowl, so it was obviously effective. Your goal is to do something similar with words in your writing! The third corner of our Rhetorical Triangle is Logos. Logos represents the role of the text in effective persuasion, as it asks us to think specifically about how well the writer has argued his or her point. It appeals directly to logic and reason. The easiest way to test out your Logos is to ensure that your argument is clear and specific; if you’re writing an academic research paper, you might underline or highlight your specific thesis statement to assure yourself that you are indeed making an argument. You should also revisit your evidence; are your sources not just well-documented, but credible? For instance, if you make a strong argument but use biased “news” sources or your friend’s blog as evidence, you immediately throw your own argument into question. Is your thesis supported well throughout the paper by strong connections and references back to the argument? Do you argue your point logically and in an organized manner, so it’s easy to follow your thesis as it develops? These are the questions you should ask yourself as you evaluate your work. In sum, the Rhetorical Triangle is a useful tool that you can use to evaluate the effectiveness of your writing. If you want to put these concepts into practice but would like some guidance doing so, be sure to visit the Writing Resources Center, and we can help you continue to improve your communication as a writer! So you’re a writer. Or maybe you hate writing. Maybe you’re a student who has been assigned a ton of writing for your class, and you find these assignments frustrating because you don’t consider yourself a writer. Maybe you don’t feel like you have enough experience with writing to call yourself a writer. Along with assigned writings, most of us have assigned readings for our classes. I’m going to let you in on a secret: even for readings assigned outside of a writing class, a text can function as a tool box. You can use the tools and techniques an author uses to develop your identity as a writer. So next time your instructor assigns a piece to read, read it as a writer. Think about it like learning to drive. Many of us have been in cars with good drivers and bad drivers. When we learn to drive, we think about the things we would never do behind the wheel as well as behaviors that are conducive to a safe drive. We select the behaviors we want to replicate when we are behind the wheel because we know that those good behaviors will get us to our destination faster and more safely. We can do the same thing when we read. Think about something you’ve read that you really enjoyed. What did the author do that made you enjoy the piece? Maybe the author used anecdotes to better illustrate his or her thought. Maybe the author is careful to use clear transitions between thoughts so that you, the reader, are never left wondering how the author moves from one topic to the next. As you think about what tools the author used to make the piece more effective or more enjoyable to read, you can think about how you might use the same techniques in your own papers. You can also think about techniques the author uses that make the piece harder to understand or less enjoyable to read. For example, maybe the author used ten dollar words when one dollar words would have sufficed. Knowing that this was not helpful for the reader to understand the piece, you can avoid this mistake in your own writing. When instructors assign readings, it’s clear to students that there is some information that the student needs to glean from the reading – that’s no secret, right? 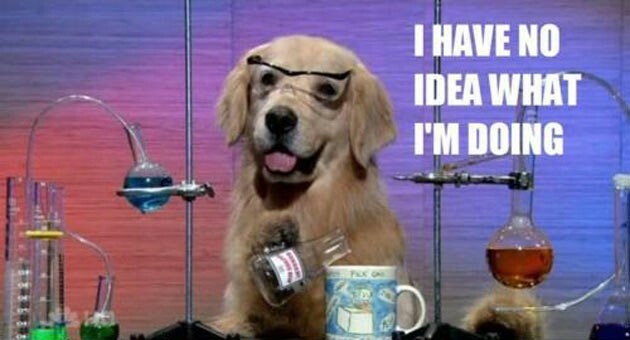 But sometimes there are secondary lessons that the instructor wants students to learn. Examples and mentor texts help students model successful writing. Many instructors will show students a sample of a successfully completed assignment. As you read such an example, compare the sample to any rubrics or assignment sheets that have been given by the instructor. What did the successful student do to fulfill all criteria of the assignment? Were the sources cited correctly? Was the paper organized logically? Was the thesis clear and consistent throughout the paper? These are just a few of the things that the student did to ensure that he or she received high marks on the paper, and you can mimic these moves in your own writing. Speaking of your own writing, once you begin to make these decisions as you complete your assignments, guess what! You’re a writer! And continuing to read as a writer will help you hone your skills. As we get closer to the end of another term, when many of you are preparing to graduate and head out into the world of internships and jobs, it seems like an apt time for the Writing Resources Center to give you a little advice about how to write the perfect cover letter. Nearly every job or internship application requires one, but they can be a bit intimidating, especially since the cover letter is almost always the first time your prospective supervisor or employer encounters you and your personality. That said, you want to put your best foot forward, and I’m here to give you some tips on how to do that. This one seems particularly difficult for a lot of first-time cover letter writers. For one, it’s easy to think that the cover letter is the perfect space to elaborate on the information we include in our resume; however, recreating your resume, even if you are elaborating on some of the more important points, is not going to get you noticed. Instead, you want to maximize your application space by including information that isn’t necessarily showcased on your resume. This will give prospective employers even more information about you, instead of several documents that essentially say the same thing. For instance, you might have included on your resume that you volunteered for a water conservation nonprofit and listed the day-to-day tasks you completed. Don’t just mention it again in your cover letter, along with your other education and work experience. Instead, if you think it’s relevant, spend some time discussing exactly what skills you developed or knowledge you acquired during your time volunteering that are relevant to the job for which you are applying. In the case of this example, this may be anything from volunteer management skills to an awareness of water conservation methods; it just depends on the circumstances and the job opportunity. Let’s face it: the job search is exhausting, and applying to several similar positions at a time–all of which may require a cover letter–may tempt you to save time and energy by submitting the same cover letter to multiple jobs. You should never do this, though. It’s too impersonal, and may give the impression that you’re just mass-applying to jobs instead of looking for the perfect fit: one that will balance your skills and expertise with the company’s needs and goals. Coming right out of your degree program (or even if you’re applying in the middle of the program and haven’t graduated yet) can make it really tempting to focus your cover letter on your education. After all, you’re in the thick of it, or just leaving the lengthy, hard work of earning a college degree behind, so it’s on your mind. Think about this, though: it’s graduation season, and you’re graduating with a few hundred others who just earned the same degree. Focusing on your education, the degree you earned, doesn’t necessarily set you apart from the other applicants who also have their degree in Business Management. What you do instead is focus on the unique aspects of your education, the parts that helped you develop specific skills and knowledge (you know, that stuff that makes you uniquely suited to this one particular job you’re applying for). Were you a member of any honors societies that allowed you to develop leadership skills? Did you work a relevant internship during your junior year? Did you take a class that changed the way you thought about catering to target markets? Did you volunteer in a relevant capacity? You should also spend some time discussing your skills, even if they aren’t necessarily related to your education–especially if your skills are perfectly matched to the job description. Are you a natural leader? Do you work well with a team? Do you learn new technologies easily? Are you an excellent written and oral communicator? Are you self-motivated? Do you like to tackle new challenges? That’s about all we have space for today, but of course, if you’re writing a cover letter and you want a second opinion, please be sure to visit the Writing Resources Center or the Career Center (career.uncc.edu) here at UNC Charlotte! The WRC works in tandem with the Career Center to help you ensure that you’re putting your best foot forward as you send out those job applications. Good luck! Diction is best thought of as the style of writing, or your “written voice.” It is “the correct choice of words in terms of their meaning and the appropriate choice in terms of the audience and purpose” (Kolln 296). We wouldn’t text or talk to our friends in the same way would would speak to a judge, say. This is because we understand that different contexts and audiences have different expectations about our language. This represents a change in diction. When we are with our friends, we don’t feel compelled to speak in an elevated way, or even be grammatically correct much of the time. At work or within other sorts of institutions like academia or journalism, we understand that our reputations hang more heavily on our ability to be professional by demonstrating acumen and speaking fluently. Having said that, good diction is not simply a matter of using elevated language or “filling the page.” The highest maxim is to always be clear. If you can write in a colloquial way but still retain the conceptual complexity of your subject, you should feel confident in doing so. You should also be aware that professors will vary in their expectations with respect to diction. Different fields and genres also vary in their standards and conventions related to diction, so be aware of your audience. Wordy: Suzie believed but could not confirm that Billy had feelings of affection for her. Concise: Suzie assumed that Billy adored her. You should also avoid vague words. If I say, “That is a bad movie,” you may or may not take my word for it, but my review would be more helpful if it were more specific. “Bad” is a word that confers very little information. Bad in what sense? Is it poorly plotted, is it tedious, are the effects cheesy, is the dialogue not believable? There are many places to go from “bad,” and getting to an interesting point that’s worth developing starts with an apt description. One also needs to vary their word choice. If I consistently describe a subject using the same adjective (even a good adjective), the writing will begin to seem lazy. Diction refers not only to a variety of language but a variety of syntactic arrangement. If I write three sentences in a row that begin, “Hana did x,” (Hana walked, Hana talked, Hana claimed…), I will seem repetitive and bore my reader. Purdue’s OWL offers 15 possible revisions of the sentence below. Observe the ways in which the rhythm and emphasis shifts in each, and how you respond to each sentence given the ways in which the information is organized. Your diction is your written voice, and it is as much a part of your identity as your speaking voice, so treat it with care and attention. Determine the sorts of written voices in the world you like and regard them as influences. Broaden your vocabulary, and develop a voice that is clear and unmistakably yours.